Barry Allen's faced Reverse-Flashes before, but what happens when the new Flash villain... is his own girlfriend? That's the question being posed in the current pages of DC Comics, as the intrigue of The Flash: Rebirth takes an unexpected turn. The relaunch of the series saw dozens of Central City residents join the Speed Force, but things had gone back to normal in the past few months, after Barry Allen dealt with the return of Eobard Thawne, the most well-known villain to bear the name Reverse-Flash. Honestly, Eobard Thawne might be a less painful villain when all is said and done. The existing Flash fans who haven't kept up with his Rebirth adventures may be shocked to hear anyone but Iris West referred to as Barry Allen's romantic partner, but such is comic book rebooting and relaunching. Barry and Iris are still close friends in DC's post-New 52 continuity, perhaps fated for something greater, but at least on paper, Dr. Meena Dhawan was his destined match. When the aforementioned Speed Force storm granted The Flash's powers to dozens of innocent Central City residents, It was Dr. Meena Dhawan who led the operation to study, assist, and train them to become a new generation of Flashes. She even took the name 'Fast Track' and a black and yellow superhero suit of her own, having been blessed with Speed Force abilities herself. Romance was immediate, with Barry revealing his civilian identity to her (a more rare decision in comics than on TV). Which made it all the more tragic when she was cornered by the speester villain Godspeed, who killed her pupils and left no trace of the good doctor for Barry to find. That is, until The Flash #32 saw a woman dressed in a new, black and white version of Barry's own Flash suit burst out of the Speed Force. Dr. Meena Dhawan's return should have been cause for celebration, but her time in the Speed Force showed her a grave truth: Barry Allen is dying. To explain the reason Barry is dying would mean explaining that nature of the Speed Force and the Negative Speed Force, created as the source of the Reverse-Flash's powers. The logic is as much fantasy as science fiction, so the simplest explanation is the best: Barry Allen beat Thawne by encountering, absorbing, and struggling to control the Negative Speed Force within his own body. Which is where Dr. Meena Dhawa comes in, having concocted a method extracting the Negative Speed Force from Barry so that the conflict destroying him could stop. ... And also, so that she could take it for herself. It's still a bit unclear as to what name or designation Dr. Meena Dhawan will take: the new Reverse-Flash would be accurate, since she's powered by the same Negative Speed Force that kept Thawne running for years. In the meantime, the moniker 'Negative Flash' may be used to reserve the most iconic villain name for a select few (but adding a brilliant, devious female to the group wouldn't be turned down by fans). Whatever the case, Meena's motives are all in question now. Issue #34 reveals the true extent of her plans, having worked to unlock the secrets of the Speed Force before she was granted a direct line to it... and using that knowledge to aid her colleagues at Black Hole - a military group looking to steal those powers for their own purposes. And by earning Barry's trust, and allowing Meena to take the Negative Speed Force for herself, the superhero played a more willing part in the creation of his villain than ever before. 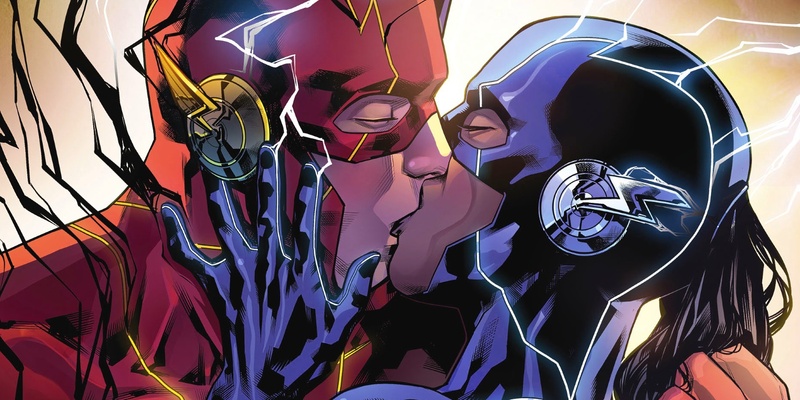 The next issues should resolve most of our questions, but the future of this 'Negative' speedster who stole Barry Allen's heart long before his speed is anyone's guess. Michael Moreci, Joshua Williamson, and Pop Mhan delivered a heck of a twist (and a killer costumed villain, to boot), so we can only hope a villain like Dr. Dhawan will be sticking around the DC Universe in some form or another. Whether Barry Allen will ever be the same - and whether this betrayal will push him closer to, or further from the other potential romances fans hope to see... only time will tell. The Flash #34 is available now.